Major General Andis Dilāns was born in Ilūkste, Latvia, on 27 September 1970. MG Dilāns entered the Latvian National Armed Forces as a cadet and graduated with distinction a platoon leader course in 1992. He earned a bachelor’s degree in pedagogy from the National Defence Academy, Riga, Latvia, in 1995. He is a graduate of the Latvian University, Riga, Latvia and has the Second-Level Professional Education Diploma of Manager of External Relations Division from the Institute of International Relations. He also graduated with distinction the Baltic Defence College, Tartu, Estonia as the second best student of Class 2000. His education continued at the National Defence University National War College, Washington D.C., the USA in 2011 and he holds master's degree in National Security Strategy Science. MG Dilāns’ command and troop leadership positions include the position of Deputy Chief of Defence, the Chief of Joint Staff, Latvian National Armed Forces (LNAF) and the Director of the Higher Command and Staff Course in the Baltic Defence College, Tartu, Estonia. Other commands include the 1st (LATBAT) Infantry Battalion, Latvian Infantry Brigade, the 1st Company, Baltic Peace Enforcement Battalion where he led 1st Latvian Company-size deployment to international operations, assuming the position of Company Commander of the IFOR - LAT/SWE Coy 2IC and S3 Planning Officer position of the SFOR - SWE Bn-Bosnia in 1996/1997; and Course Leader/Company Commander in the National Defence Academy. As a Lieutenant, he was a Platoon Leader of the Border Guard’s Course in National Defence Academy. 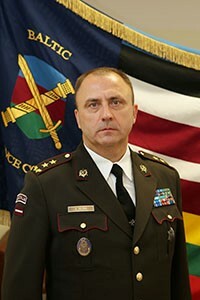 MG Dilāns’ staff positions include: Military Representative of Latvia to NATO in 2013; Chief of Joint Staff, Latvian National Armed Forces, where he was co-chairing Latvian defence system reform group in 2009; Chief, Operations Planning (J3) Department, LNAF Staff, in this position he led a military planning group for first deployments of Latvian troops to Afghanistan and Iraq in 2003; Chief, Operation Branch, Operations Planning (J3) Department, LNAF Staff; Chief, Military Co-operation Branch, International Relation and Military Co-operation (J7) Department, LNAF Staff; and Senior Staff Officer, Combat Support Branch, Operations Planning (J3) Department, LNAF Staff. MG Dilāns’ leader development and education positions include Deputy Course Director and Course Instructor of the Higher Command and Staff Course in the Baltic Defence College. He made a remarkable contribution to an establishment and further build-up of the Higher Command and Staff Course, which was later accredited by NATO ACT. MG Dilāns’ awards and decorations include: the Order of Viesturs (2nd grade), the CHOD Award of Merit (3 awards), the CHOD Award for Distinctive Service, the Republic of Latvia MOD Medal of Honorary Recognition and Medal of Merit for Contribution to Armed Forces Development, the Estonian Defence Force General Staff Cross of Merit (2 awards), the Lithuanian Defence Force Medal of Merit, the Baltic Defence College Medal of Merit, the Baltic Defence College Service Cross, LNAF International Operation Remembrance Medal, NATO Medal, Swedish Armed Forces’ International Operation Remembrance Medal. On 8th March 2016, MG Dilāns was inducted into the BALTDEFCOL Hall of Fame. Platoon Leader Course (with distinction), National Defence Academy, Riga, Latvia. MG Dilāns is married to Inga and has a son, Ralfs. His hobbies include tennis and outdoor activities.